Need an impressive soup course for a holiday dinner party? Try this smoky roasted pepper soup duo, cooked separately, but combined into one bowl for serving. Everyone will love it, including folks who follow vegetarian, vegan, paleo, or gluten-free diets. This post was sponsored by Carapelli. Make sure to use a high-quality olive oil in this soup, such as Carapelli® first cold pressed Extra Virgin Olive Oil. “Cold pressed” means that the oil was not heated above a certain temperature during processing. 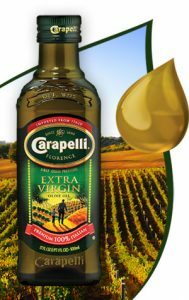 “First cold pressed” means that the oil was created from the first pressing of the olives and therefore retains more nutrients. When I made this soup, I had some left over and I used it as a sauce for a veggie stir-fry that I served over rice. It would be equally delicious with pasta. Alternate serving option: If your holiday entertaining requires finger food, try serving this roasted pepper soup duo as drinkable shots. 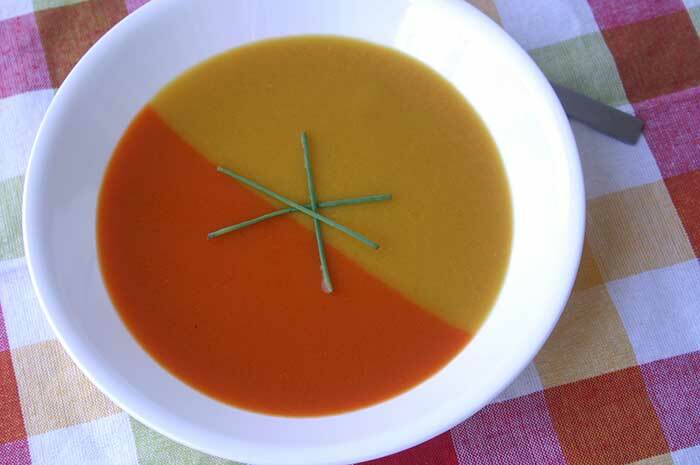 Follow the same technique described below, but pour the two soups into small cups or shot glasses instead of a soup bowl. No spoons required! Broiler method: Line a baking sheet with parchment paper. Place peppers on sheet and broil about 6 inches from the heat. When the peppers are black on top, turn them with long-handled tongs. Continue this process until all peppers are blackened on all sides (some may roast faster than others depending on size and shape). Put red peppers in one bowl and yellow peppers in a separate bowl. Cover bowls with kitchen towels or cloth napkins. Open flame method: Use long-handled tongs to hold one pepper at a time over a gas stove burner. Rotate the pepper until all sides are blackened. Put red peppers in one bowl and yellow peppers in a separate bowl. Cover bowls with kitchen towels or cloth napkins. Repeat with remaining peppers. Let peppers sit in bowls for 10 to 15 minutes, then peel and discard skins from red peppers. Remove and discard seeds and stems. Return red peppers to bowl. Repeat with yellow peppers, returning them to their bowl. Heat olive oil in skillet over medium-low heat. Sauté onion and garlic for 5 to 10 minutes or until onion is tender. Remove from heat. Combine yellow peppers, half of onion mixture and 2 cups of vegetable stock in blender. Process until mixture is completely smooth. Pour into a 2-3 quart saucepan. Wash out blender container. Combine red peppers, the remaining onion mixture and the remaining 2 cups of vegetable stock in blender. Process until mixture is completely smooth. Pour into a separate 2-3 quart saucepan. Bring both pepper mixtures to a boil, then cover and reduce heat to low. Simmer 10 minutes. Remove from heat. To the red pepper mixture only, add vinegar and salt and pepper to taste. Stir both pepper mixtures. Fill a measuring cup or small glass with approximately 1/2 cup of the red pepper mixture and an identical measuring cup or small glass with approximately 1/2 cup of the yellow pepper mixture. Simultaneously pour the red pepper mixture into one side of a soup bowl and the yellow pepper mixture into the other side. (Try not to dribble the pepper mixtures down the sides of the bowl; aim to hit the “base” of the bowl.) Repeat with 4 additional soup bowls. Garnish with chives, if desired. Disclosure: This post was sponsored by Carapelli. All opinions are my own. This post contains at least one affiliate link, which means if you click it and make a purchase, I will receive a tiny fee. Please see my disclosures page for more information. I can always use more olive oil. I love it for roasting veggies like asparagus or brussels sprouts with a little fresh ground salt and pepper. I have never had pepper soup! And I love peppers! Going to give this a try! I love your tasty duo of a fine soup, a lovely presentation too,….yummmmm.